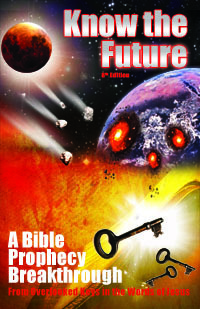 Since the earliest editions of Know the Future, the next expected event in Bible prophecy has been the M.E. Nuclear War . This is the conflict by which Damascus shall finally have “ceased to be a city and become a ruinous heap” (Isaiah 17:1). From what Isaiah and Psalm 83 say, Israel is attacked (for a fourth time since 1948) by an overwhelming coalition of Arab neighbor nations. Israel responds to this existential threat by using nuclear weapons, the so-called “Samson Option,” something Israel has threatened in two past conflicts (1973 Yom Kippur and 1990 Gulf War). This scenario explains how Damascus is both destroyed and never rebuilt like it would be after an earthquake. The nuclear fallout prevents resettlement of Damascus like it did for the Chernobyl reactor's worker town of Pripyat. As a result, the world's oldest continuously inhabited city will remain ruins despite being the capital of Syria (at least until the restoration of all things in the Millennium). The question that has always dogged me about this event is when does it happen in relation to the start of 70th week? Clearly, there are events inside the beginning of the 70th week that depend on this war happening first. The chief and most obvious example of this is as our move to a “believer's settlement” in Judea  starting in 2024 for safety from WW3/Wormwood in 2026 or the so-called “beginning of sorrows”  per Joel 2:32=Matthew 24:16. Non-Jews are not allowed to reside in Israel  and it will take the heavy casualties and need for aid in the wake of a war to even temporarily change that longstanding immigration policy. 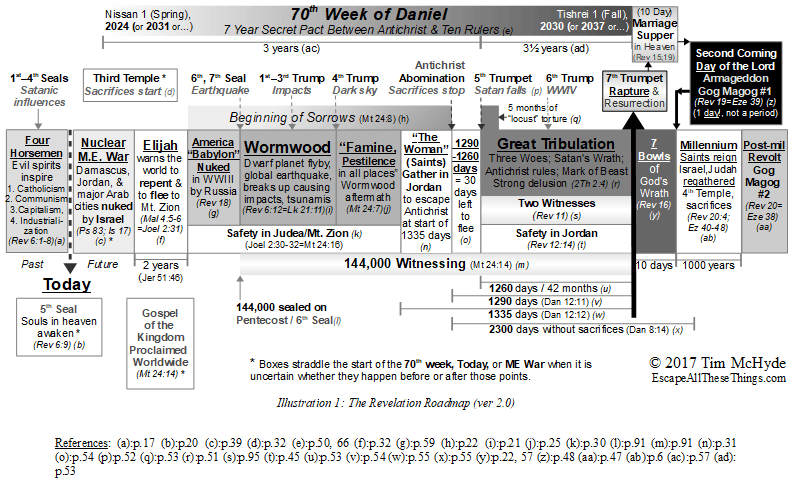 If you have not already done so, be sure to read the earlier study on 2026  before proceeding as that will lay the foundation of the 70th week needed to understand the chart above and the article below.